Glenn M. Shaw, Established Mural Artist Designed for Schmitz-Horning Co. The Old Canal by Glenn M. Shaw, small-scale salesman sample, chromolithograph, 4-panel pattern. Glenn Moore Shaw was a local Northeast Ohio commercial artist, who had a studio in Lakewood, Ohio, and he designed a number of patterns for the Schmitz-Horning Company, sometime between the 1930s and 1950s. His artist wife Elsa Vick Shaw also designed for the company. Both had a friendly and close working relationship for a number of years with my grandfather, Warren Reynolds Schmitz, who ran Schmitz-Horning from 1938 to 1960. The scenic designs included five illustrated maps (which were said to be accurate), The Old Canal (or Canal Days) wallpaper or wall mural pattern set which depicts the Ohio & Erie Canal between Cleveland and Bath, Ohio, and Old Dominion wall mural pattern which was a set of seven panels. Each panel in the Old Dominion pattern was 30” x 80” plus, printed in multi-color chromolithograph, to be trimmed at the desired height. Old Dominion by Glenn M. Shaw, chromolithograph, 7-panel pattern, each 30″ x 80″+. 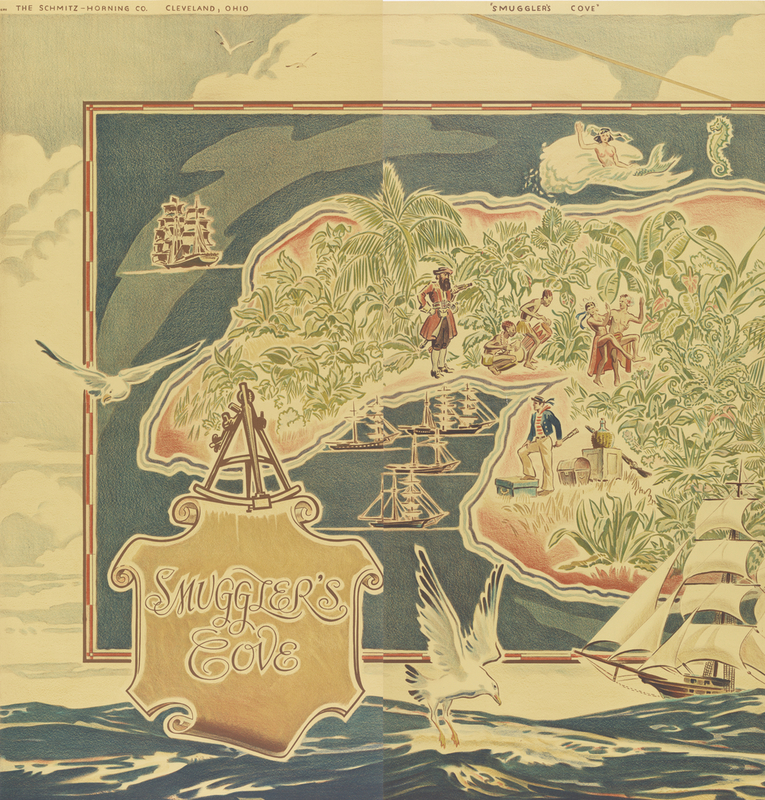 Shown is a section of the pictorial map Glenn Shaw designed called Robinson Crusoe, which is part of a collection of Schmitz-Horning wall coverings at the Smithsonian’s Cooper Hewitt Design Museum (a gift from the Wallpaper Council, Inc.). In addition to professional fine art painting and printmaking, he taught mural painting and advertising design at the Cleveland School of Art for 35 years, and painted murals in three post offices, Canton, Warren, and Perrysburg, Ohio. Robinson Crusoe Pictoral Mural Map, one panel 40″ x 60″, designed by Glenn M. Shaw. Above catalog illustration, below section of actual paper (photo: Cooper Hewitt). Image from Cooperhewitt.org used under the Fair Use copyright act.